The Liberal NSW Government’s reckless decision to remove Liverpool via Regents Park trains (on the Inner West Line) in 2013 and to remove express City trains for Lidcombe – Auburn – Granville in the peak (on the Western Line) in 2017 highlights a significant ignorance of history. The construction of the railway from Regents Park west to Cabramatta (connecting it to Liverpool line) was completed in 1924. As recorded in the local history, the reason for this railway extension was to reduce congestion on the Western Line between Lidcombe and Granville. With the opening of the new railway in 1924, Liverpool and southwest Sydney commuters could travel on the shortest/fastest route to the City via Regents Park hence reducing congestion on the route via Granville. With more Liverpool to City via Regents Park trains, more track space would be freed up for Western Line trains. 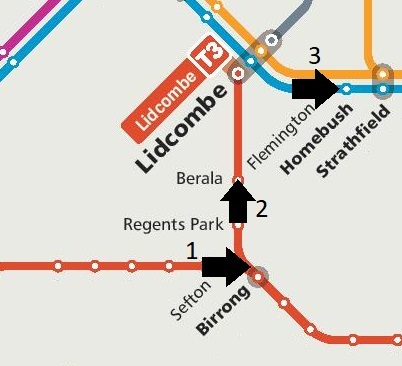 Multiple interchanges (Birrong, Lidcombe, Strathfield) are required for former Liverpool via Regents Park (Inner West Line) commuters. Resulting from the government’s removal of Liverpool via Regents Park (on the Inner West Line) trains in 2013, commuters were forced to interchange at Lidcombe onto already overcrowded Western Line trains. Inner West Line trains terminated at Homebush and Bankstown Line trains terminated at Lidcombe. 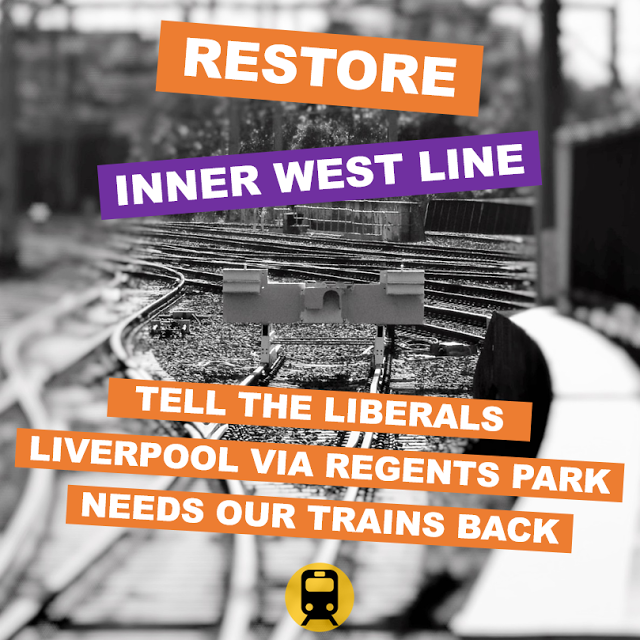 In an attempt to address overcrowding on the Western Line, the government has decided without proper community consultation to remove the Western Line trains that former Liverpool via Regents Park (Inner West Line) commuters interchanged onto in 2017. The reasons provided for removing express and most limited stops trains from Liverpool – Granville – Auburn – Lidcombe – City in the peak was to reduce congestion and overcrowding on the Western Line. The new 2017 timetable reduces also fast train services from Liverpool to City by 30%. 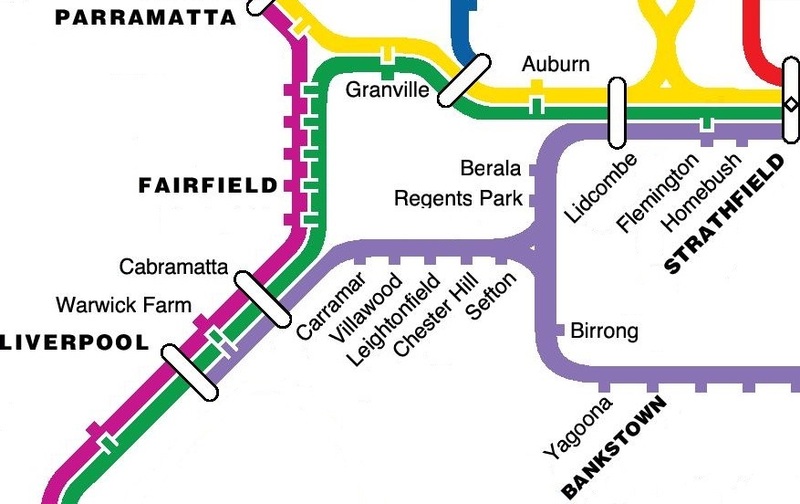 Not only has this government unnecessarily increased overcrowding on the Western Line by removing Liverpool/Bankstown to City via Regents Park trains in 2013, it has continually downgraded train services for southwest Sydney. Map of former Inner West Line (Liverpool to City via Regents Park) pre-2013 timetable changes. If the government was serious about fixing the trains, reducing overcrowding on the Western Line and building a world class transport system: it’s first priority should be to look at the history and learn that restoration of the Liverpool to City via Regents Park train is fundamental to the entire Sydney Trains network.